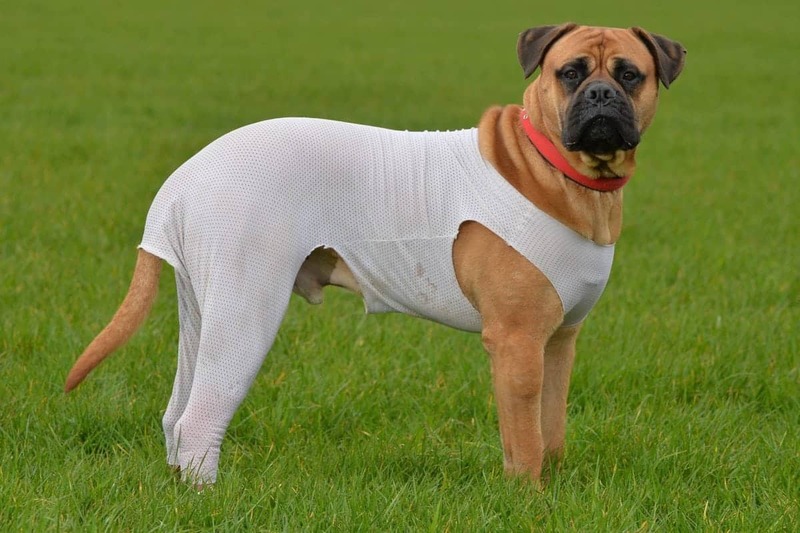 Diesel, a six-stone bull mastiff, is thought to be the first dog to have used the pioneering new garment. Yvonne Nugent, 47, was left devastated when the three-year-old pet pooch was caught under her trailer as she dropped off hay for horses on her farm. Diesel was left with three bone-deep lacerations on his back leg. After considering amputation and putting him down, vets at The Crescent Veterinary Clinic, Leics., decided to try the pioneering new technology on him. The KANfix bandage, created by Stridez, is a whole body garment which wraps around the wound to give extra support through low level compression. It was created by Dr Nick Allen and Sally Cowan, who have both worked with Olympic champions as well as SKY Cycling, England Rugby and Ferrari. Mum-of-two Yvonne said: “It really was a horrific accident. “I was putting hay out for the horses, using the trailer and the Land Rover. “Diesel hopped on the back of the trailer, as he always does. He’s an incredibly active dog, and loves running around with us as we put the hay out. “We don’t know exactly what happened, but we think that Diesel caught himself on either the trailer or the Land Rover. “There were three deep lacerations on his leg, down to the bone. He was still stood up, we got him into the van and took him to the vet’s. “I dealt with it at the time, but afterwards I was quite distraught. “The vet told us he may have to have his leg off, be put to sleep, or they could try and heal his leg. “We had 15 minutes to make a decision – having a three-legged dog on a farm wasn’t an option, we wondered how he would cope. After an anxious eight-hour wait, three-year-old Diesel came out of the operating room on all four legs on January 28. Yvonne, a teacher, added: “We brought him home in the evening and stayed up with him all night, he was in shock. 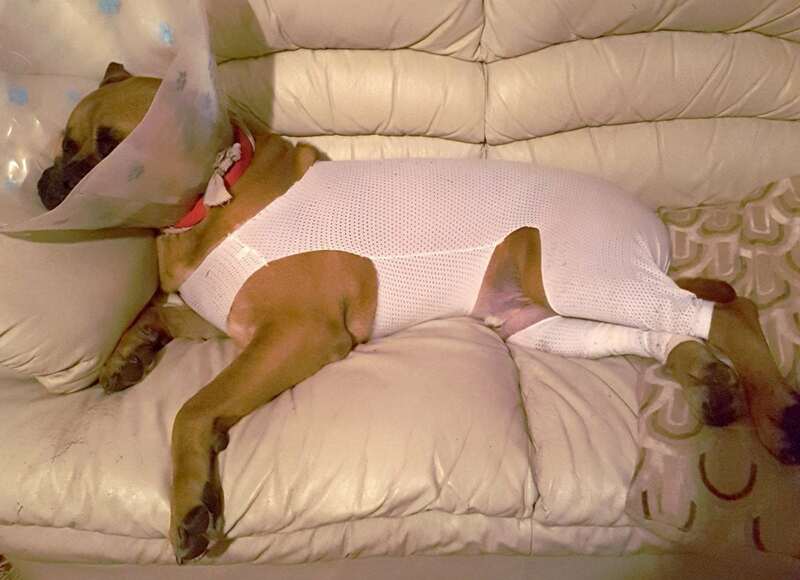 “The full abdominal bandage Diesel had to wear wasn’t helping his healing fast enough. “He had to have a huge leg dressing, which just wasn’t working for him. “He was sweating a lot because there was so much bandage, and I could tell that he was very uncomfortable. 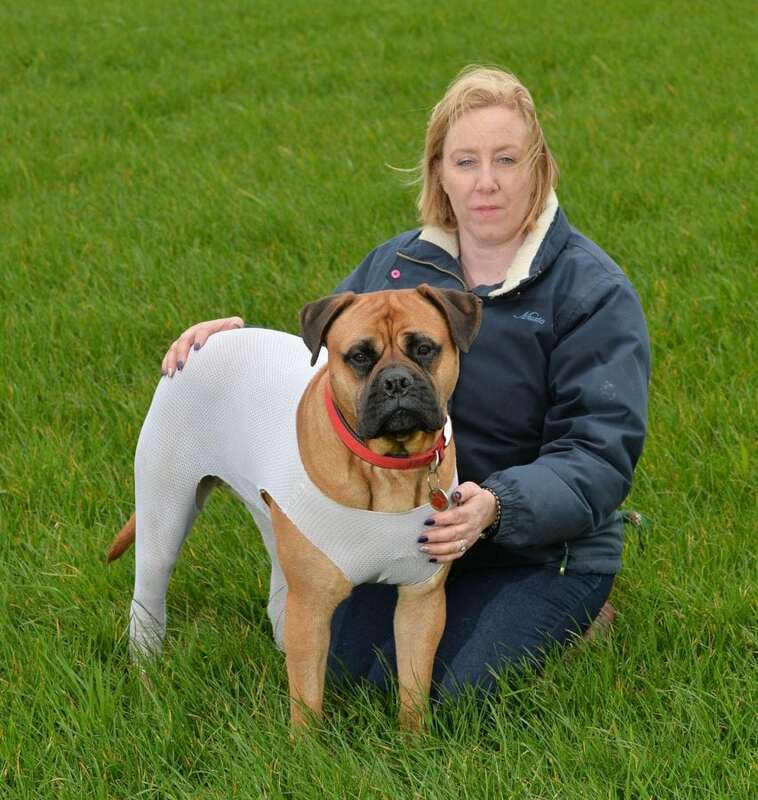 “After her consultation with other vets, Lucinda decided to try a new protective suit which would protect against irritation and infection which stretches and restricts his movement less. “It’s worked wonders. He looks quite mean but the suit makes him look like a big softie, which he is really. “He doesn’t look so scary now. “I am so grateful for what the vets did for him at The Crescent – they went above and beyond the call of duty. “Diesel’s a very active dog, so it’s tough for him to have such a severe injury. He’s very envious of my other two dogs, who get to run off when we go for walks. “One of the best things about the suit, though, is that it restricts his movement. Before he was overexerting himself and risked doing further damage to the wound. “We were taking him to the vet’s every day at first, then every other day. He goes into the waiting room and sits in a chair, just like a person and waits to be fetched. 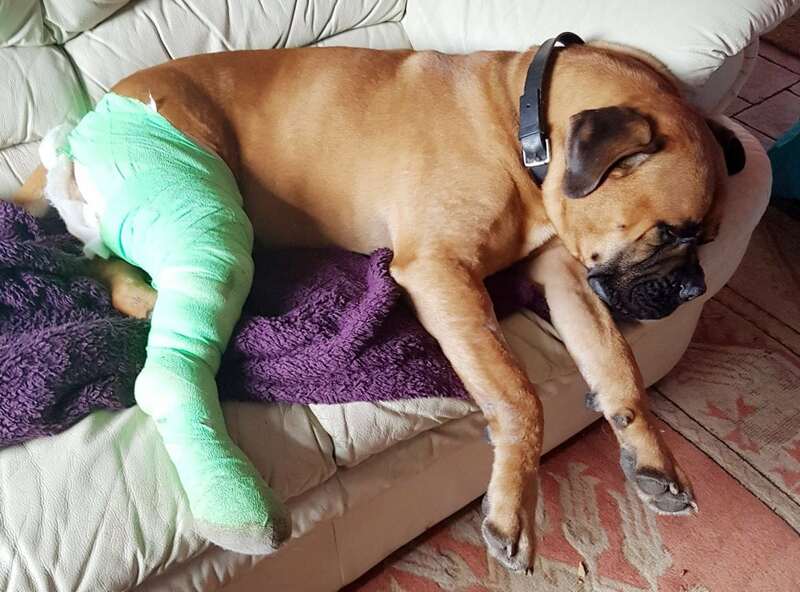 Senior vet Lucinda Myring, who treated Diesel said she decided to use the product created by Stridez, after seeing him struggle with normal bandaging. She said: “A rep from Stridez came to visit us, as part of a first push to try and sell the KANfix bandage to vets across the country. “Diesel’s wounds hadn’t been healing with his old bandage, and we were really keen to give it a go. “We ordered a couple, and when we used the suit on him it worked almost straightaway. “He’s the first to use the suit in this particular vet, and there’s chance that he’s the first dog to use it in this country. “It works to destabilise the joint, which makes it easier for us to put bandages underneath the suit. “It holds the bandages firmly in place, so that they don’t move around on the joint, which could cause discomfort or infection. “We’ve been absolutely delighted with how its work on him, and will certainly be looking into ordering more. Next PostWatch – Dozy driver mounts two parked cars!